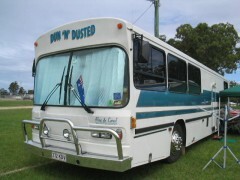 "Dun N Dusted" is owned by Max and Carol Herbert from Brisbane QLD. a 1980 leyland which has had a heart transplant from the leyland engine is now a 671 GM screaming Gm as they are effectionatly known, we purchased the shell back in 2006 and it was completed 2007 and set about designing the rig ,previously we have had coaster buses so now space and weight wasnt an issue. we gave David from Batterys Traders Slacks Creek our design it was the first big rig he had done and a fine job he has done at that. 2 Captains chairs gives both driver and passenger a great view of the road ahead. 3 seater lounge which converts to a double bed full 2 pak interior with black granite look benches and table tops. Mid mounted kitchen with all the modern covieniences, washer /dryer seperate toilet and showere with a large queensize raised bed.